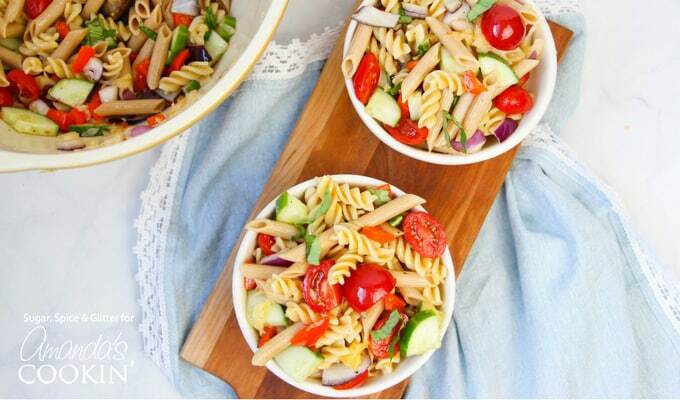 Summer Pasta Salad: there's no better way to get in your veggies! This Rainbow Summer Pasta Salad is not only pretty, it’s delicious, too! 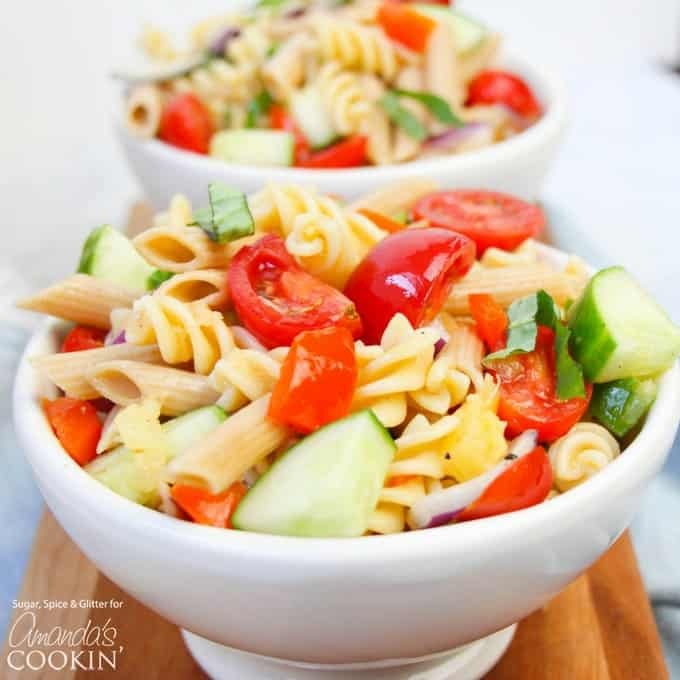 With a sweet hint of pineapple and a generous amount of vegetables, this is a pasta salad that you can feel good about loading up your plate with- similar to this Summer Vegetable Pasta Salad! There’s no better way to get kids to eat their vegetables than making them pretty and rainbow-themed! My kids always go crazy for my healthy rainbow spaghetti but I wanted a fresh take on that recipe for summer- Rainbow Summer Pasta Salad. A twist on a pasta salad that’s not loaded down with mayo – just vibrant, fresh flavors. Nutritionists always say in order to eat healthily, incorporate as many brightly colored vegetables as possible into your dishes – and eating a rainbow of vegetables is definitely a fun choice! We used a mixture of regular and whole-grain pasta for some added fiber and protein for this rainbow summer pasta salad. RELATED: Looking for another dish to bring to your next summer potluck or party? Our KFC Coleslaw copycat recipe is always a crowd pleaser! 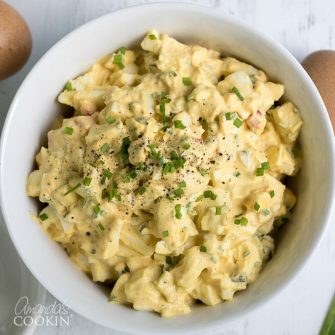 I first experimented with putting pineapple in my Hawaiian Macaroni Salad last year and it was delightful! An unexpected hint of sweet that worked well with the other vegetables. However, if you’re on the fence with that, almost any of these vegetables can be swapped out for other alternatives in their color family. 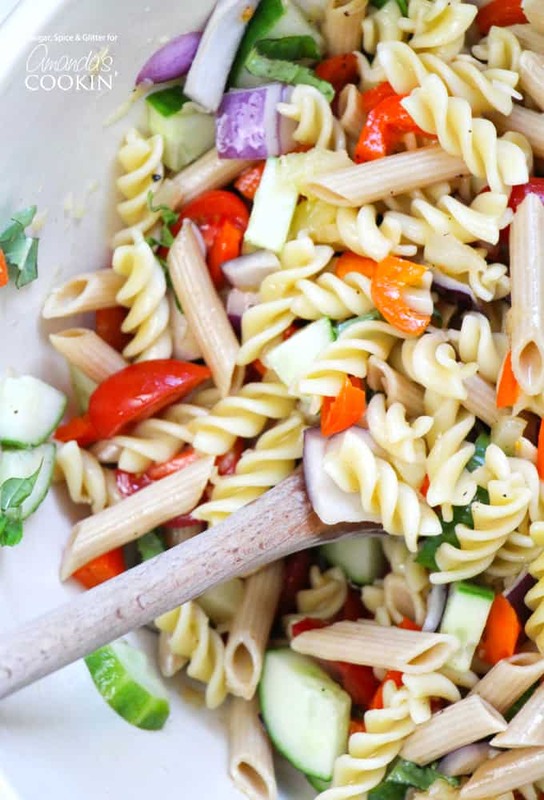 Just about anything works for this rainbow summer pasta salad! *Note: we used half a box of regular fusili noodles, and half a box of whole grain penne. 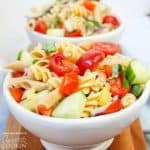 This easy pasta salad is a delicious contribution to a neighborhood potluck and a surefire bet for your own summer BBQ! No mayo means you don’t have to worry about it spoiling in the sun, and whole grain and plenty of veggies mean you can still indulge in dessert without feeling like you overdid it. 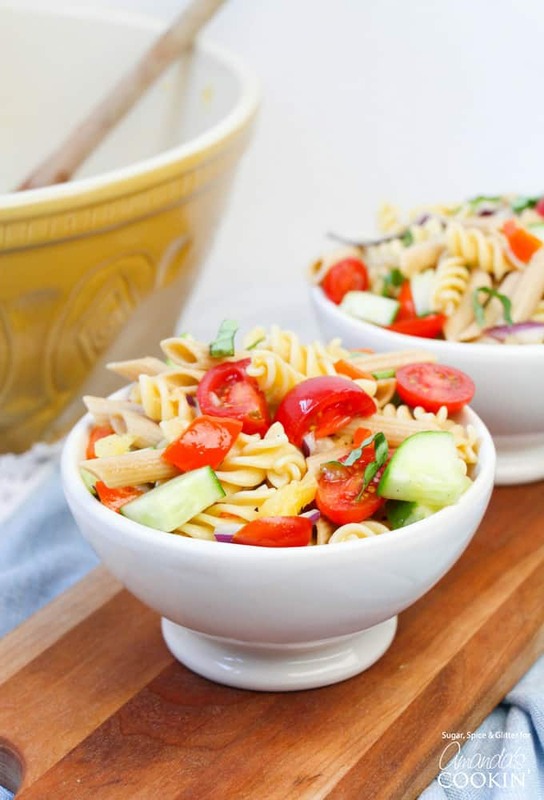 It’s definitely a new summer pasta salad recipe go-to! Don’t forget to stop by and check out more pasta salads-Tuna Pasta Salad, Pesto Pasta Salad, and Mediterranean Pasta Salad are a few to start off with! This Rainbow Summer Pasta Salad is not only pretty, it’s delicious, too! With a sweet hint of pineapple and a generous amount of vegetables, this is a pasta salad that you can feel good about loading up your plate with. Cook the pasta to el dente, according to package directions. Rinse and allow to cool as you prepare your vegetables. Combine the chopped vegetables and pasta in a large serving bowl. Pour over the oil and stir to coat, then season to taste with salt, pepper, and chopped fresh basil. The flavor gets even better after keeping the salad in the fridge overnight.